Double L Floor Sign Base - Various Sizes Adjustable Double LL Floor Signs - Various Sizes Small Bulletin Sign Holder - Slide In Frame 14" X 22"
Graphic size 8-1/2"W x 11"
Black Magic Floor Stand - Slide In Frame 22" x 28" Deluxe Bulletin Sign Holder - Slide In Frame 22" x 28" Poster Sign Holder - Slide In Frames 22" x 28"
Baroque Elegant Easel Moderne Lobby Easel-Sliding Adjustable Sign Holder Sturdy Poster Sign Holder - Slide In Frame 22" x 28"
Holds graphics 2-12"thick up to 30 lbs. Display stands can be considered as one of the most inexpensive advertising methods for business. Unlike popular yet costly advertisement means such as media (TV, radio) commercials, print publications, and even Internet ads, floor stands displayed in front of a shop or store can effortlessly attract people towards the product or service being offered at a minimal cost. Stands strategically positioned where potential customers can easily spot such as by the hallway, entrance door, or even in walking lanes will produce a client base from those driving, jogging, or even just walking by the business. The curiosity of onlookers can be taken advantage of when promoting anything related to the store or shop. As long as the presentation is enticing enough and the product or service is of high quality and is beneficial to the target market, then a stand guarantees generated income from everyone invited to avail of the product or service through the ad presented. Floor stand displays can accommodate various items but the most common of which are images, banners, and posters; hence, these are sometimes referred to as poster stands. You can easily display posters and images that are graphic rich, colorful, and made of any type of material. Even simple text banners work for this purpose as long as the message being conveyed is clear and concise. But for better results, it is recommended to utilize full color digital print designs. According to relevant research, people are more attracted to colorful and lively material as compared to dull, boring, and lifeless messages. Other than maximizing the potential of poster stands through digital printing, customization and personalization can be applied by choosing the appropriate theme, colors, and details that match the store or shop’s overall look as well the product or service being promoted. You can incorporate your business’ logo, style, color, and so on. You can even specify designs and prints based on your own personal preferences. The actual floor stands are generally aluminum or metal and are available in various sizes and designs. You can choose a product that suits your needs or style. As for posters, most are printed digitally with clear acrylic materials. Displays should be regularly changed to keep your message fresh and updated. You can show floor signs about the shop or store such as business hours, contact details, menu, and products or services showcased. You may also promote sales specials, deals, discounts, events, and impart important announcements. Most floor standing displays also feature literature holders. These will have room for flyers, brochures, leaflets, and other marketing materials you can distribute or people can freely get from the holders. The materials will also serve a similar purpose as the stands but extends coverage beyond the business’ premises. Customers can bring the materials at home, work, school, or anywhere they intend to go and may even pass the message on to family members, friends, co-workers, school mates, and strangers who get access to the materials intentionally or unintentionally. Other than being merely floor poster stands for advertising or marketing, these stands can also serve as an extension of the shop or store. You can display items for sale provided that the stand doesn’t disturb the traffic flow of people and vehicles on the street and a store representative is assigned responsibility in keeping the displays safe from burglars. Aside from selling items, the stand may also be used to offer keepsakes and samples that are relevant to what the store offers. For example, you can offer a free bite taste of a cup cake slice if you own a cup cake store, allow free sample tracks listening for a music record store, and so on and so forth. Digital was mentioned several times although we were referring to digital prints. But other than printing, you can go digital through innovative and advanced concepts. The stands can act as base to interactive message boards and even smart TVs as long as they’re sturdy enough for the challenge. The digital screens can be wired electronically in order to function, making sure that safety precautions have been observed. Stands can be made of wood, plastic, or the most common and popularly used steel available through various sizes and styles. Posters or banners on the other hand can be traditionally designed or digitally printed. •	Special sale, discounts, deals, promos, etc. Next Level Custom Signs have been an industry leader since 2001. We offer display stands and provide digital sign printing services. We design stands and even the actual banners or posters to be displayed. Your display stands and the actual posters can be customized and personalized according to your needs and specifications. You can choose colors, themes, and other details as you please. Some of our floor stand product styles include bulletin sign holders, slide in frame displays (up to triple), catalog holder, wedge floor sign base, floor mounted, pedestal type (in landscape or portrait layout), pro sign holders, curved, snap frame, telescopic, baroque, adjustable, convex, eclipse, long elliptical, double elliptical, 2 tier, with pamphlet pocket or literature holders, and so much more. Our previous clientele can vouch for our high quality products from renowned manufacturers at affordable prices. We only offer durable and attractive stands that are sold within what your budget can afford. You can even avail of discounted prices for bulk orders. You are guaranteed floor stands which will effectively convey your message and maximize return on investment. For more information, please contact our friendly and knowledgeable customer service representatives at 888.578.8100. Floor signs are one of the most affordable methods of delivering your businesses message to your walk in traffic. Next Level has a great selection of floor signs, floor stand displays, floor standing displays and floor poster stands. So if you're looking for floor signage displays, Next Level Custom Signs has what your looking for. 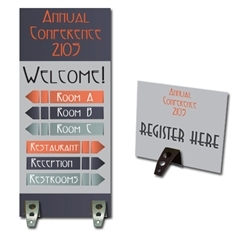 Floor sign displays are available in variety of colors and materials that meet almost any budget. Floor signs deliver a custom business message with your store information, sales events, specials etc. Floor stands attract attention and display your advertising message with a high impact poster sign design and full color digital sign print. Easily change your graphics and keep your message fresh. Floor Stands are great for any message that needs to get noticed. A great choice for your sign display needs! Some floor stand designs have literature holders - allowing distribution of your marketing materials and brochures. Since 2001, Next Level Custom Signs has been a nationwide leader in the sign display and sign printing industry. We offer floor stand poster design, floor stand displays and floor stand poster and sign printing at affordable prices. We have an excellent reputation for producing high quality floor stands that get noticed and maximize your return on investment. Quantity discounts available on most floor stand products. For more information please contact our friendly and knowledgeable customer service representatives at 888.578.8100.